Many months back, we created video slideshows from old photography books of Joplin and posted them on Youtube. Now they are accessible on our site without hunting them down elsewhere. Just click on the “Video” tab at the top of the site on the right. Enjoy! 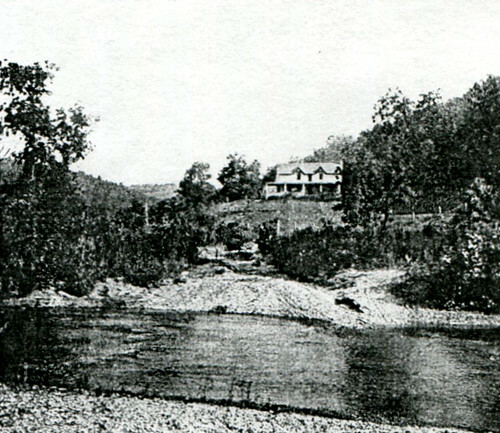 As the spring and summer months approach, we think back to days when Joplinites fled the city for a few leisurely days spent alongside a cool, clear Ozark stream. 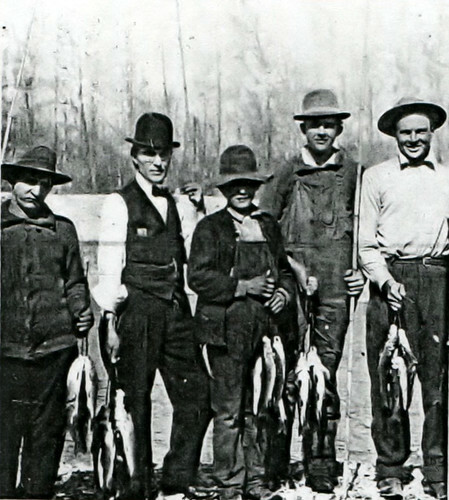 Outsiders had started flocking to the Ozarks early on, as documented in Lynn Morrow and Linda Phinney Myers’ book Shepherd of the Hills Country Tourism Transforms the Ozarks, 1880s–1930s. But while many from St. Louis and Kansas City traveled to the Shepherd of the Hills and Arcadia areas of the Ozarks, Joplinites had their own oasis just down the road. 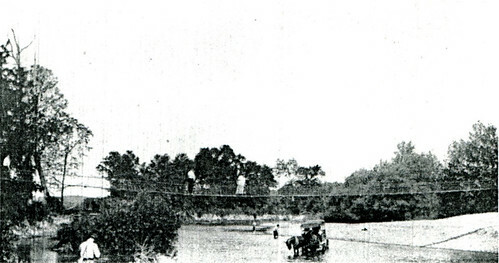 McDonald County, home to Indian Creek, Elk River, and the Little and Big Sugar rivers, became a popular destination for Joplin residents seeking relief from the heat of spring and summer. One of the most popular resort destinations was W.H. 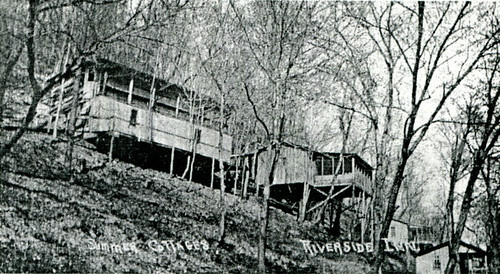 Fleming’s Riverside Inn located at Elk Springs, Missouri, forty-five miles south of Joplin. The inn was established circa 1905 and offered rooms for $1.50 a day or $9.50 a week. Guests could expect a tastefully appointed inn and rustic cottages awaiting their arrival after stepping off of a train from the Kansas City Southern Railway. 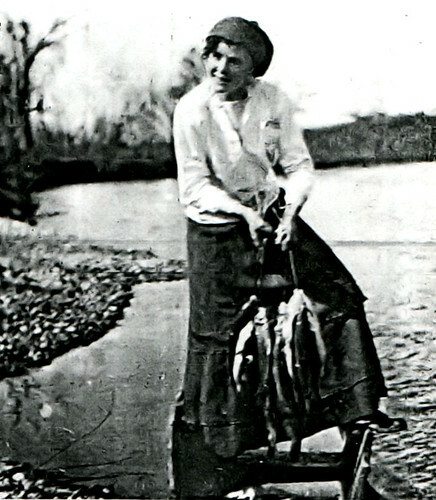 Fishing, boating, and bathing in Elk river were among the activities that guests could enjoy while at the resort. The more adventurous would find “surrounding mountains covered with heavy timber” which afforded “plenty of opportunity for exploring parties, and a number of caves” that were within a half hour’s walk from the inn. Dinner time at the inn. The way it’s done at Riverside? A view of the river below the inn. All one had to do is catch a train headed south from Joplin and soon find themselves in the midst of an Ozark oasis. Years later the inn burned down, but for a brief period it offered a respite from the ills of city life for many a Joplinite. For those interested, the Riverside was located three miles west of Pineville on what is today Highway H.
A bicyclist pauses outside the Keystone Hotel at 4th and Main. Curiously during this era, Joplin, Columbia, and Carthage all passed city ordinances that would have prohibited the use of bicycles within each city. 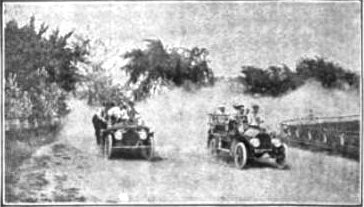 The Missouri Division of the League of American Wheelmen went to court and defeated each ordinance, leaving Joplin residents to dodge and fend off careless cyclists. W.S. Gray, a machinery dealer located at 718 Jackson Avenue in Joplin, regaled a News-Herald reporter with stories of working for Moffet and Sergeant in the early 1870s. Fires today still make the headlines, but the risk to communities as a whole are not as significant as they were one hundred years ago. Before the emergence of professional fire fighters with modern training and equipment, fires posed a considerable risk to towns and cities populated by wooden structures and defended by brave but untrained bucket brigades. Joplin, like many other cities across the country, learned the hard way of the necessity of a professionally trained and equipped fire department. As one would expect, this story of historic Joplin begins with a fire. More than thirty years had passed, but the crusty pioneers who witnessed the city’s birth still recalled the first great blaze that occurred in 1874. Only a year old, Joplin was just beginning to build on the success of the mines. For a city in its infancy, the fire was incredibly destructive. Joplin’s volunteer fire department, formed in 1872, was headed by Edward Porter. Porter oversaw a ragtag collection of twenty men who rode on horseback to fires carrying only their axes and water buckets. It was this small, determined band of men who were able to beat back the fire of 1874. Despite the volunteer fire department’s best efforts, an entire block on Broadway was lost, which at the time consisted of two residences and a store room. The only building that survived the blaze was the Masonic Hall which was built of brick. The potential for devastation had been great and had only been narrowly avoided. The limited success of the volunteer fire department convinced Joplin’s city leaders that something had to be done to improve the department’s ability to combat fires. The answer was a 100 gallon tank filled with a chemical fire suppressant set on the back of a handcart. It was stored in Joplin City Hall which at the time was situated in the bottoms that lay roughly in the middle of town, or rather, between the two former towns of Joplin and Murphysburg that had combined only a few years before. The fire suppressant’s record was mixed. A year after its purchase, it failed to stop a fire that burned down two homes, including one on Mineral Street that belonged to John Allington. This defeat may have been made even more embarrassing as Allington was an influential resident. A bucket, like the one featured in this photograph from the time period, was one of the main tools available to combat fires. It did not take long for the volunteers to realize that the buildings that made up the majority of the block between Third and Main were lost. Built entirely of wood frame construction, a fire could not have asked for any better source of fuel. Firefighters began a valiant effort to save the buildings located at opposite corners of the block as they were considered cornerstones that anchored their respective intersections. Onlookers crowded to watch the fire feed upon the block’s buildings and the fight by the firefighters to save the corner buildings. The firefighters succeeded in their desperate battle but the center of the block was reduced to charred ashes. The next great fire came four years later in 1880 at the famed White Lead Works of Joplin. The White Lead Works arose from the idea of E.O. Bartlett, a young professor from Pennsylvania. Bartlett believed the process of smelting lead at the time was a wasteful one that allowed lead carbonate to be lost in the exhaust fumes. To curb waste, Bartlett devised a redesigned exhaust system that tripped a flour-like substance, commonly known as white lead. Bartlett requested the permission of Joplin’s largest lead producers to build his experimental lead factory on their site which would use his new exhaust system. The owners, E.R. Moffett and John B. Sergeant, agreed to the idea. Such was the success of Professor Bartlett’s plan that Moffett and Sergeant quickly implemented the process in their primary lead factories. White lead quickly became a valuable commodity due to its use as a paint pigment and was even used by the United States Navy to paint their ships. It was also commonly used in house paint and posed a great threat to the health of children who might consume the paint flakes. It was late in the afternoon on April 3, 1880, that a great column of white smoke rose upward into the sky. If that was not enough to garner the attention of the people of Joplin, then the constant shrill screams of the plant’s steam whistles certainly did. Something was wrong. Perhaps someone had stacked the sacks of white lead too tightly together and the cumulative heat of the contents had reached a critical point where the bags had burst into flame. At least, that was the theory settled upon later, but at the moment, all that was known were shouts in the streets of Joplin, “The white lead works are on fire!” The white lead works employed a significant number of the city’s population and an even greater number arrived to watch it burn and look for loved ones that worked there. The white lead works of Joplin after they were rebuilt following the devastating fire. Moffett, who was at work at the time, coolly remarked, “Well, she’s gone.” Moffett and Sergeant’s employees had been at their posts with the factory running at full capacity when the fire started. Fortunately, employees were quickly evacuated and Moffett was credited with keeping the crisis in check. All that remained was for the fire department to attempt to save the factory. It was a lost cause before the department even arrived. Joplin’s volunteer firefighters failed due to the enormity and hazardousness of the blaze and they nearly lost the fire department’s chemical tank after it became trapped between two buildings. The overall loss was valued at $20,000, a great sum in 1880. It was a jarring loss for both the city and its growing economy. The white lead works would be rebuilt, twice its former size, but the city recognized the need to reorganize the volunteer fire department. Volunteer Fire Chief Frank Williams may have stepped down at this point and handed the reins over to Taylor Mayfield, although it is not clear. The city ordered water hoses for the department to use and requested that every business keep a barrel of water and bucket handy. The city also asked for additional volunteers. 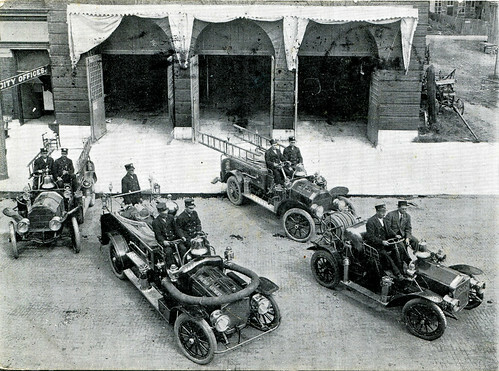 It would be another fire the same year that spurred the city to continue its efforts to modernize the fire department. During the late hours of the morning the city’s sole opera house, the Blackwell, erupted in flames. Rouse from their sleep at two in the morning, volunteers valiantly tried to save the large three story structure that lined fifty feet of Joplin’s Main Street. Located just north of the city’s courthouse, the flames could easily leap to the next building and destroy the civil center of the community. Clark Claycroft, a volunteer at the time and later a fire chief, recalled, “We tried our chemical tank but the fire was too much for that, and the bucket brigade did but little better.” As the flames consumed the Blackwell, volunteers recalled the fire hoses that lay inside the fire barn nearby, having arrived only the day before. “So a bunch of us went to the fire barn, broke open the boxes, and put the hoses together and carried it to the fire. In half an hour, we had two streams of water going.” It was not enough to save the opera house. The Blackwell was lost, but the efforts did protect Joplin’s City Hall which briefly caught fire. The damage was severe and pushed Joplin’s city leaders to continue to improve the volunteer fire department. Clark Claycroft was selected as fire chief with former city marshal J.W. Lupton appointed as his second in command. Three hose companies were established with their own stations. George Payton, a future fire chief, oversaw Station One located in East Joplin. Station Two stood at Second and Joplin and was commanded by A.B. “Tony” McCarty, and further south, at Seventh and Main, Station Three was overseen by L.A. Fillmore. It was this foundation upon which the Joplin Fire Department was built upon when George Payton became the first paid fire chief at $50 a year. The year was either 1882 or 1884 as various sources dispute the founding date. 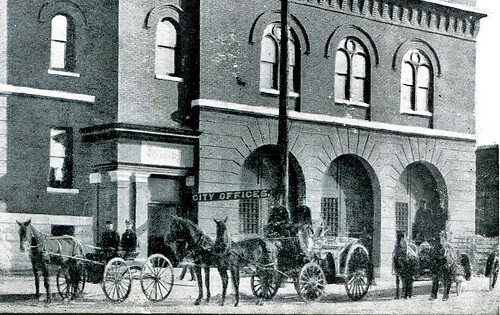 Before the adaptation of the automobile, horse drawn carries were the main method for the Joplin Fire Department to move their fire fighting equipment about the city. 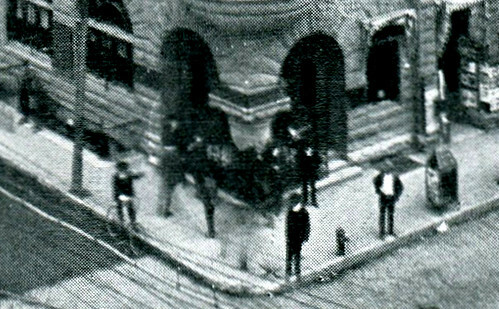 By 1890, the city’s water works had been expanded and improved upon which assisted the fire department with one hundred pounds of water pressure. 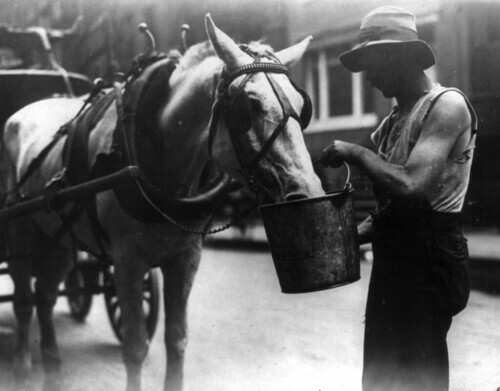 Up to and past 1900, the companies used horse drawn carriages to respond to fire alarms, but one man would change that. Alfred Webb of Joplin, who operated an automobile livery across the street from one of the fire stations, revolutionized fire fighting. With permission of the fire chief, he mounted one of the chemical tanks and some hose on a motor car and a new era of fighting fires was born. The mechanized apparatus, dubbed “The Goat,” raced swiftly to the scene of fires, and often times was, as Joplin historian Joel Livingston reported, “ready to return when the hose company, drawn by horses, arrived on the scene.” By 1908, the city equipped all its stations with the motorized units and was perhaps one of the first cities to take such a step in the first years of the twentieth century. The motorized Joplin Fire Department with its two ladder trucks, chemical truck, and fire chief's engine. 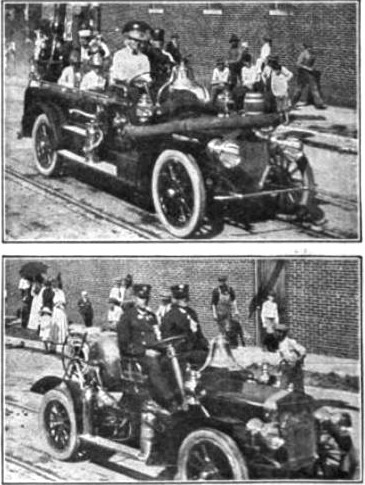 This innovation even made the pages of a 1909 issue of Popular Mechanics, which reported on the “up-to-date fire fighting machines.” The four cylinder gas engines of the cars also powered the pumps and worked at a furious 75 horse power. The chief fire engine carried a thousand feet of hose and numerous four gallon tanks of chemical suppressant, in addition to a water pump. The chemical engine, as it was called, hauled a sixty gallon tank, 200 feet of hose, and was powered by only a 25 horse power engine. In addition, the department owned two ladder trucks powered by 50 horsepower four cylinder engines which carried a thousand feet of hose, plus two 30 foot extension ladders. Another view of the fire chief's engine and chemical engine of the Joplin Fire Department. The Joplin Fire Department's two ladder trucks racing on a track. From a small crew of twenty volunteers with buckets and axes to a modernized fleet of fire engines, the Joplin Fire Department entered the new century. Despite the hazards it had already faced, it was not until 1923 when the department lost its first fireman, one of four honored by the department for their service and sacrifice. 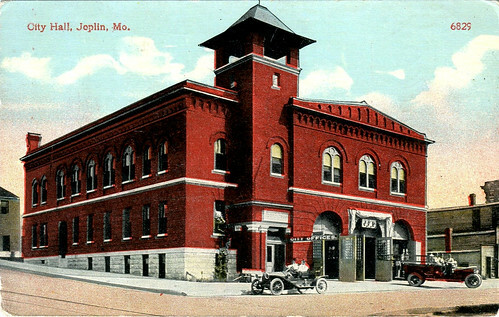 Joplin City Hall, which also housed the Joplin Fire Department station. Note the ladder truck on the right. Sources: “A History of Jasper County, Missouri, and It’s People,” by Joel T. Livingston, Popular Mechanics, “The Story of Joplin” by Dolph Shaner, “Tales about Joplin…Short and Tall,” by Evelyn Milligan Jones, the Library of Congress, and the Joplin News Herald. Despite the widespread fear of the “Yellow Peril,” not all Americans viewed their Chinese neighbors as economic competitors or sinister agents of the Chinese Emperor. It also helped if they were hard working Christians. Preston McGoodwin, a reporter for the Joplin Globe who went on to serve as U.S. Ambassador to Venezuela, profiled one of Joplin’s Chinese residents, Ah King. King, owner of the Crystal Laundry located at 818 South Main Street, was lauded by McGoodwin as a “devout Christian worker.” He arrived in San Francisco, California, at the age of fourteen sometime around 1880. Although he did not tell McGoodwin how he ended up in the Midwest, he did relate that he arrived in Joplin in 1900 after living in nearby Springfield, Missouri. He reportedly astounded members of Joplin’s small Chinese community when he announced he was a devout Baptist. McGoodwin informed the Globe’s readers that King “differs materially from the average church and association members in that he is at all times devout and intensely sincere.” McGoodwin also praised King for his “scrupulously clean” business that employed several white girls who washed and ironed customer’s clothes. King’s luck did not last. A few months later, the Joplin Globe reported that Ah King and his brother Sam Long left town after he fell behind on rent to the Leonard Mercantile and Realty Company. 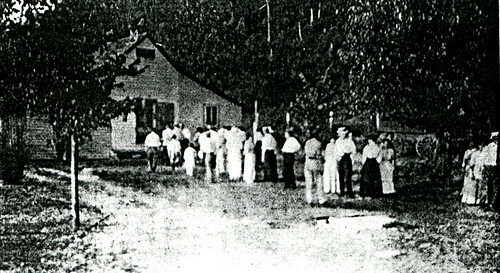 It was noted that King had always borne an “excellent reputation” and was a “consistent member of the Baptist Church.” Joplin residents who knew King insisted he left to find money to pay his landlord, he left behind in his wake two angry female employees who were forced to wash and iron laundry to make up for their lost wages. “He owes us, the wretch,” one of the girls growled as she starched shirts. Her compatriot added, “It’s a perfect outrage to treat us girls so.” Others thought that King was spirited away by members of the Boxers, an anti-Western Chinese group, because he openly expressed his disapproval of the group. King did not return to Joplin. 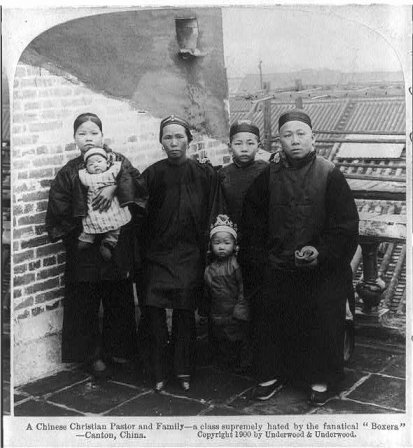 Chinese Christians, as pictured here, were detested by the Chinese Boxer Movement. This may have been why some believed the Boxers to be involved with King's disappearance. A chop suey restaurant in Chicago. Restaurants were always an option for immigrants seeking to find their place in a community, like Sing in Joplin. Sing’s luck did not get any better. A few days later after his wife left him, two men came into his restaurant and refused to pay the bill. When Sing demanded they pay, the men attacked him. The proprietor ran to the back of his restaurant, grabbed a revolver, and chased the two men out onto the street. He fired two shots but failed to hit either man. After an investigation, Sing was arrested for disturbing the peace by Deputy Constable Norman Bricker. His fate is unknown, but one can hope that he found a wife who would not run off with his cash. The experiences of Sing and King represent one more window into the world of Joplin’s Chinese immigrants. Did every immigrant come across similar bad luck or were our two migrants featured here the exception? Although historians cannot judge whether or not either man was truly accepted as a member of Joplin society, King may have been looked upon more favorably, as he was a devout Christian. Sing, on the other hand, may not have been as tolerated because he had been charged with selling opium and was married to a white woman during a time of great racial intolerance. Perhaps both men were fortunate enough to obtain their American dream far from the shores of the Celestial Kingdom. Sources: Library of Congress, Joplin Globe. Walter Williams, founder of the University of Missouri’s Journalism School, once wrote “Joplin is a city of self-made men, nearly every one of the moneyed citizens having made his fortune there. They are largely American born and American educated.” As Williams observed, Joplin was primarily populated by American citizens, but there were many immigrants who called Joplin home. Few, however, were Chinese. Chinese immigrants arrived on America’s shores beginning in the late 1840s during the California Gold Rush. Two decades later, even larger numbers of Chinese laborers were recruited to work on the Transcontinental Railroad. The influx of cheap labor and threat of economic competition sparked racial animosity. Violent anti-Chinese riots broke out in several American cities, including Denver, Seattle, and Rock Springs, Wyoming. 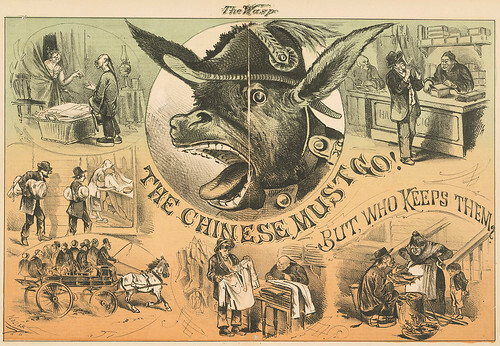 In 1882, in response to growing outrage over Chinese competition, President Chester A. Arthur signed the Chinese Exclusion Act. The act suspended Chinese immigration to America for a period of ten years. Only those Chinese immigrants who arrived prior to the act’s passage were permitted to stay. At the turn of the century, both St. Louis and Kansas City were home to sizable Chinese communities but the Chinese presence in Joplin was less substantial. Historians can be stymied by gaps in the historical record. The earliest Joplin city directory to have survived the ravages of time dates to 1899, leaving a gap in the city’s history that ranges decades. Meanwhile, county histories often overlooked and ignored the presence and contributions of minorities. Although the state of Missouri attempted to collect birth and death records beginning in 1883, the effort failed until 1910, when the Missouri General Assembly passed a law making it mandatory for counties to record birth and death information. Few archival collections can boast of letters, diaries, and manuscripts from early Joplin, much less one kept by Chinese resident. Thus, it is often difficult to piece together the history of an immigrant group at the local level, especially if it was a particularly small immigrant group. According to the 1870 U.S. Federal Census, there were no Chinese immigrants living in Joplin. By 1880, however, at least one Chinese immigrant called Joplin home. Lum Wong, a single twenty-seven year old native of China, listed his occupation as “servant – clerk in store.” He could not read or write English. Wong lived with sixty-four year old Jacob Wise, a retired merchant. A few years later, in1883, an advertisement appeared in the Joplin Daily Herald for a “Chinese Laundry” run by Lee Hem. Although Lum Wong did not appear in the 1900 U.S. Federal Census, five other Chinese immigrants are listed as residents of Joplin. Most, if not all, worked in the laundry business. G. Goro, a thirty-six-year-old immigrant, lived on Main Street. According to the census, his neighbors described themselves gamblers, blacksmiths, day laborers, miners, and traveling salesmen. Sing See, Jung Jin, and Low Chung described themselves as “partners” in a laundry. See and Chung listed the year of their immigration as 1877 while Jin arrived in American in 1879. Thirty-four-year-old A. King, who roomed in a boarding house on Main Street, listed his occupation as “Chinese laundryman.” Unable to work in the mines, Chinese immigrants were forced to eke out their living in whatever industry was accessible, and often greatly restricted along racial lines. By 1910, only two Chinese immigrants lived in Joplin. One, Jung Low, gave his occupation as “Chinese laundry.” The other, John Jungyong, ran a restaurant. Within ten years, the Chinese population in Joplin grew when Toy Jung, an immigrant to America since 1890, opened a Chinese restaurant. Toy, the proprietor, was assisted in his business by a partner, Ling Kwong, who had reached the states five years after Toy. Additionally, five cousins of Toy worked as cooks and waiters. Only two of Toy’s cousins were born in California; Toy, his partner, and his three other cousins were all born in Canton, China. Another Chinese run business listed in 1920 was a laundry run by a Chinese-American named Charlie Hoplong. The 1930 Census revealed the presence of another Chinese restaurant run by Shang Hai Lo, a sixty-year old restaurateur from Canton, China who had arrived from China the same year as Toy Jung. It also noted the absence of Charlie Hoplong and his laundry business. Four years later, Toy Jung, who had spent at least fourteen years in Joplin, passed away leaving only his wife Quong Jung to mourn his death. Sources: United States Census, “History of Jasper County and Its People” by Joel Livingston, and the Joplin Daily Herald, “The State of Missouri” by Walter Williams, and the Library of Congress. This page took 0.283 seconds of computer labor to produce.